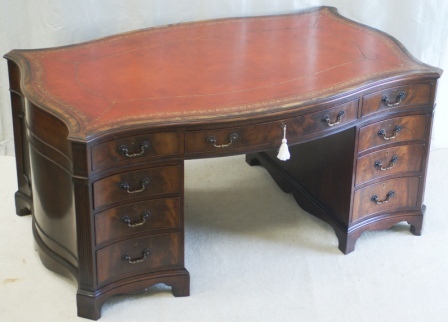 Superb Antique Flame Mahogany Twin Pedestal Partners Desk with Serpentine front and sides. Edwardian. Excellent size and wonderful colour. Tooled red leather writing surface with excellent patina. Original fittings. Nine drawers to the front elevation and three drawers and two shelved cupboards to the rear. Three piece construction. Good history. Superb colour and proportions. Flame mahogany. Nine graduated drawers to front elevation. Serpentine sides, front and rear. Drawers and cupboard doors have curved fronts.